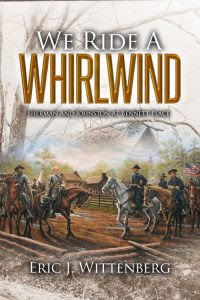 Review of Wittenberg - "WE RIDE A WHIRLWIND: Sherman and Johnston at Bennett Place"
As is the case with the 1864 Atlanta Campaign, recent times have witnessed the rapid expansion of books written about the 1865 Carolinas Campaign. The two related volumes authored by Mark Bradley—Last Stand in the Carolinas: The Battle of Bentonville (1996) and This Astounding Close: The Road to Bennett Place (2000)—clearly stand out from the rest in terms of offering the best narrative account of this final phase of the war in the western theater. In his new book We Ride a Whirlwind, Eric Wittenberg (the author of his own fine contribution to the campaign literature, 2006's The Battle of Monroe's Crossroads and the Civil War's Final Campaign) has wisely avoided duplicating Bradley's effort. While Wittenberg does begin with two chapters of background material, the primary focus of his study is the three meetings between generals William T. Sherman and Joseph E. Johnston, the result of which was the surrender of much of the remaining Confederate forces in the field. In the three chapters discussing the surrender negotiations, Wittenberg maps out who was present, what was said, and what proposed agreements and documents resulted from the meetings. While the practice of filling Civil War books with full-document transcriptions is all too often a hallmark of lazy writing and interpretation, it is more helpful here because motivations were badly misconstrued at the time and the wording of the early agreement hammered out in the second meeting caused an uproar in the North among newspaper journalists and the political leadership in Washington. As the book shows, during the second meeting at Bennett Place, General Sherman, who was not aware of Lincoln's earlier letter to Grant strongly reminding the general to negotiate with Lee on military grounds only, inserted many political agreements into his Bennett Place convention with Johnston. With the Washington leadership already in a frenzy over the assassination of the president, this presumption by Sherman caused further outrage among his military and civilian superiors. Army Chief of Staff Henry Halleck and Secretary of War Edwin Stanton quickly nullified the agreement, but they also overreacted and harshly rebuked Sherman in a very open and public manner that profoundly embarrassed and angered the victorious war hero. Sherman's famous snubbing of Stanton at the Washington parade of armies is covered in the book, as is the general's flat refusal of old friend Halleck's olive branch. Sherman was unmoved by friendly suggestions that his shabby treatment at the hands of the government, as outrageous as it was, should be at least partially forgiven by appreciating the cabinet's raw emotions at the time. Clearly, Sherman overstepped his authority no matter how much he felt his actions were in line with the stated wishes of Lincoln, and the general's written defense of his actions (which is very well outlined in the book, with much supporting documentation and interpretation in an appendix) remains unconvincing. However, one tends to agree with Wittenberg (along with the Sherman partisans) that the demeaning blowback inflicted on Sherman was also indefensible. With the prior convention rejected, the third Bennett Place meeting attempted to reach a final agreement, but Sherman and Johnston quickly reached an impasse. Sherman then turned to his second-in-command, General Schofield, who promptly offered his own solution and composed the final documents that were agreed upon by both parties. As Schofield later wrote, his role in the matter seemed destined to be glossed over by history, but Wittenberg's book gives him proper recognition. Robert E. Lee is often singled out (by Jay Winik and others) for nobly quashing all entreaties to disband his army into small guerrilla groups instead of surrendering in 1865. In We Ride a Whirlwind, Wittenberg maintains that General Johnston deserves just as many accolades on this point, perhaps even more so given that Johnston's command was not surrounded at the time of surrender or even in direct contact with the enemy. The practical temptations to disperse would have been even greater in Johnston's situation. In the author's justifiable view, Johnston did the right thing to end the fighting when he did and should be remembered for it. The book's appendix section is very extensive. In addition to orders of battle for both sides, there are lengthy documentary treatments of Sherman's defense of his rejected convention (as mentioned above), Confederate cabinet discussions over whether to surrender or fight on, and Confederate general Wade Hampton's attempts to avoid surrendering. The volume also contains an interesting epilogue on Bennett Place and its preservation history. For all the reasons mentioned above, We Ride a Whirlwind is a useful tool for studying and understanding the finer points of the great surrender that occurred in North Carolina in April 1865. It persuasively argues that Bennett Place, where Johnston surrendered far greater numbers of fighting men than Lee did earlier, deserves to be regarded as a capitulation event more level in status to Appomattox than history has generally portrayed it. Booknotes: Three Cheers for the Chesapeake!